직지사 비로전 앞에 세워져 있는 3층 석탑이다. 1974년 대웅전 앞 3층석탑 2기(보물 제606호 문경 도천사지 동ㆍ서 삼층석탑)와 함께 경상북도 문경 웅창마을 북방 금강가의 옛 도천사터에서 옮겨온 것으로, 1단의 기단(基壇)위에 3층의 탑신(塔身)을 올리고 있다. 바닥돌은 넓적하게 짜여져 있으며, 그 위로 여러 장의 석재를 조성한 2단의 높직한 괴임을 두어 기단을 받치고 있다. 기단은 몇 개의 널돌로 구성되었으며 각 면의 모서리와 가운데에 기둥 모양의 조각을 두었다. 탑신은 몸돌과 지붕돌이 각각 한 돌로 이루어져 있고, 몸돌에는 모서리마다 뚜렷한 기둥 모양의 조각이 있다. 지붕돌은 얇고 평평한 편으로 밑면의 받침을 5단씩 두었고, 날카롭게 들린 네 귀퉁이로 인해 경쾌함이 느껴진다. 탑신의 1층 몸돌이 2·3층에 비해 매우 높으나, 전체적으로 비례가 적절한 세련된 모습으로, 9세기 통일신라 후기의 특징을 잘 보여주고 있는 뛰어난 작품이다. 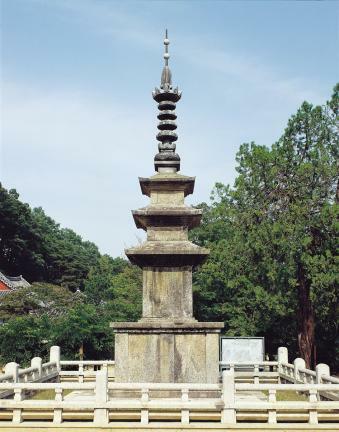 This three-story stone pagoda stands outside the Birojeon Hall of Jikjisa Temple. 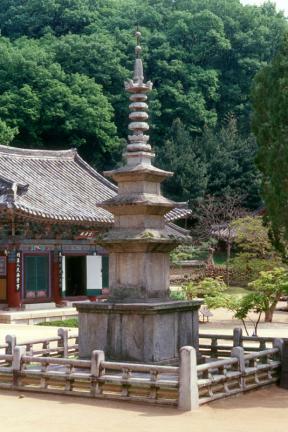 It was brought to its present location in 1974, along with the two other pagodas outside Daeungjeon Hall (Treasure No. 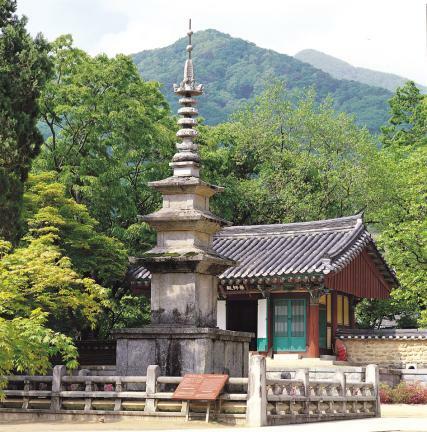 606) from the former site of Docheonsa Temple, located at a bank of the Geumgang River, lying north of Ungchang Village in Mungyeong, Gyeongsangbuk-do. The pagoda is mounted on a single-tiered base. 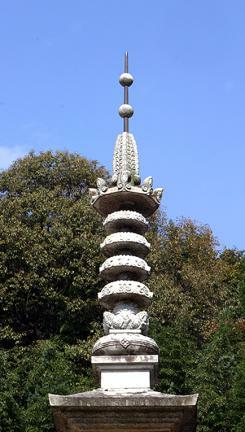 The pagoda base rests on a stone support in two levels placed on top of flag stones at the bottom. The base is made of a series of stone slabs and has pillar-shaped details sculpted at the corner edges and in the middle of the four lateral faces. The body and roof of the pagoda at each of the three stories are separate stones. A very distinct pillar-like design is added at corner edges of the body stone. The thin and shallow-pitched roof has a five-tiered moulding at its base. The sharply turned-up corners of the roof give an air of lightness to the pagoda. Despite the fact that the body stone at the first story is greater in height than the two others, the pagoda appears proportionate and elegant. 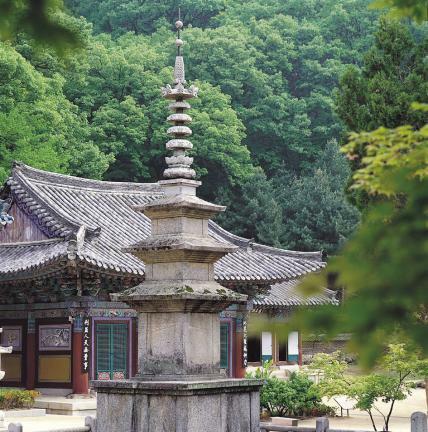 The three-story stone pagoda of Docheonsa is a masterful piece of pagoda architecture in a classical 9th-century (late Unified Silla) style.